If you love to knit socks then Vogue Socks Two is another must have for the avid sock knitter. 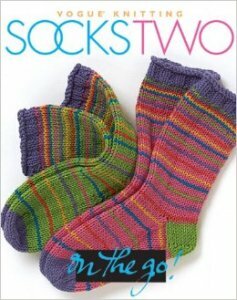 A variety of sock patterns is included in this book and will keep you busy for years to come. Each of these 20 fun projects lets you experiment with color, pattern, design, and technique. “This is another offering in the popular Vogue Knitting on the Go! series…featuring designs by leading knitwear designers….This volume includes some ambitious projects…But overall there are more socks here to interest beginning and intermediate knitters….Recommended for public libraries.” —Library Journal.